Bhanu Kapil’s “From The Wolf Girls of Midnapure” opens with disorientation: transliterated Bengali, shots of whiskey taken right from the subject’s palm, and fragmented prose characterized by broken, incomplete, sentences. 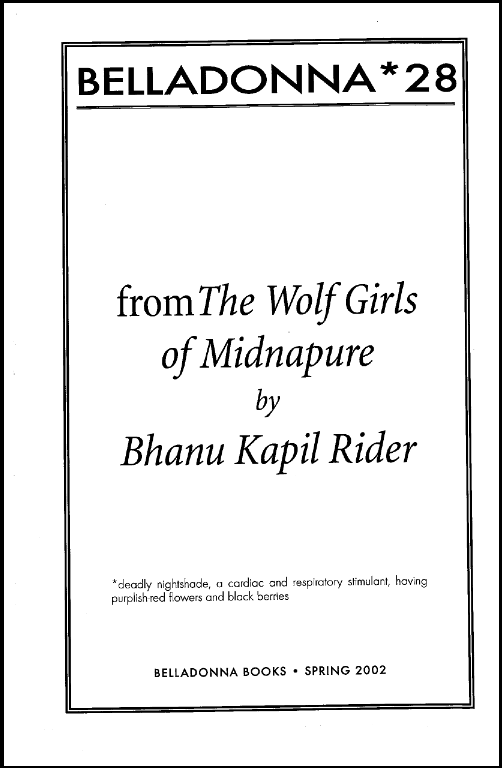 As is the case with much of Kapil’s work, “From the Wolf Girls of Midnapure” serves as a psychological exploration of a traumatized subject as much as it does a story; the prose becomes a mimetic vehicle for the subject’s consciousness as much it is a drive train to carry readers through the text. In the case of this text, the subject is a historical avatar, Kamala, a reportedly feral child rescued by reverend Joseph Singh – renamed here “the Reverend Mother” (2) in 1920’s Bengal. Kapil shapes the textual fragmentation to match that of a developed mind being forcefully integrated into civilized living; the text re-shapes itself as the story moves along, as the wolf girls of Midnapure move away from their “feral” upbringing and transition into the human fold. Though, as the prose grows into a more coherent story, readers are forced to ask how differently do we treat humans and animals when we consider a person to be more animal than human? The text initially engenders feelings of appreciation by the humane actions of Reverend Mother. She brings Kamala food and language. She brings Kamala humanity, purging her canine side. But the humanity she brings is tainted by gross debasement. An English bishop and his wife come to visit. Yet they do not call on the Reverend Mother to help or even to commend her for her generosity to Kamala; they appear “to watch: her eat” (3). The Reverend Mother provides “Raw mangoes” and “curd,” refined foods for Kamala. Kamala comes to these foods with “animal behaviors” (3), and this appears to be the real draw for the Bishop Wassingham and his wife. Kamala’s meal is not about what but about how she eats it. For the bishop and his wife, the Reverend Mother’s project is not about goodness but about what Kamala, looks and acts like. As if at a circus, Wassingham and his wife dish out money in response to the spectacle. At the end of the meal, “the Bishop Mrs.” places a shilling in Kamala’s hand saying, “There you are, my pet” (3), a saying that is believably anachronistic, but a very intentional word choice on Kapil’s part, drawing attention to the continued dehumanization from which Kamala suffered. Sadly, the Reverend Mother seems to hold Kamala in a similar regard. Though her objectification of Kamala is more covert, readers can see it in her communication with Kamala. Kapil heavily punctuates the Reverend Mother’s commands to Kamala, breaking them down into the simplest commands and the shortest imperatives annunciated by exclamation points and sentence fragments. The syntax parallels the text’s opening, but here, the composition does not reveal a disjointed psyche undergoing a late introduction to language and civilization. Rather, it shows the Reverend Mother’s callous treatment of her human ward. Still catering to Wassingham and the Bishop Mrs., the Reverend Mother shouts, “Some tea, perhaps. Or salts. Darling, your hanky. My water! Kamala! Can you hear me?” The language becomes more desperate as the line moves forward. The Reverend Mother begins with a simple request – tea. Then she needs salts, an unconnected want, indicating that she might simply desire some service from Kamala. She then directs Kamala to her hanky, another implication that she needs to meticulously pay attention to her appearance as if she is letting her animal side show. The Reverend mother next exclaims “My water!” revealing that she is not just calling on Kamala to help out with two guests, instead, Kamala is more house servant than child. In such a fashion, Kapil draws attention to the more obscured inhumanity of the Reverend Mother due to how she treats the “wolf girl” of Midnapure whom she adopted, thereby giving some of Kamala’s humanity back to her. Kamala witnesses unnamed persons dancing with skirts and sashes made of baby wolf skulls – not even baby wolf skulls, the skulls of unborn wolves, ripped from their pregnant mothers. The unidentified actors who tear the skulls out “reason” that the wolves are just fat, acting as if they could not tell that the wolves were pregnant. Kapil draws a quiet analog between these mysterious jungle dwellers, grotesquely withdrawing unborn wolf-pups for the sake of a dance ceremony and the Reverend Mother. After watching the Reverend Mother’s behavior towards Kamala, it seems as if her deed saving Kamala was more akin to ripping her out of her Mother’s womb for own decoration than it was to a saving, adoptive act. In “From The Wolf Girls of Midnapure,” Kapil creates a text where the syntax matches the subject, the psychological exploration of traumatized individual. Yet in doing so, Kapil brings up even bigger questions. Rather than limiting this text to the treatment of Kamala, she forces reader to question how they treat subjects deemed lesser – whether it is as animals, or even racially and culturally. In the end, Kapil’s text establishes a sense that our inhumane treatment of others reveals us to be more animal than human, not the other way around. Tim Etzkorn lives in Yangyang, a small fishing town in South Korea where he teaches elementary English.